Between now and 2050 the U.N. predicts our population will grow to 9.6 billion. As a result of that population growth, we see demand continuing to grow through the end of the decade and beyond by over 500 million bushels of corn and over 200 million bushels of soybeans annually over the next 5 years. The question we need to answer is – how can farmers increase crop production sustainably to meet significant increases in demand? Demand has largely been met over the past five years by putting more corn and soybean acres into production. Essentially about 60 percent of corn and 85 percent of soy production increases have come from bringing additional acres into use over that timeframe. As we work to sustainably increase crop production we can’t continue to devote more arable land to agriculture. That means we need to increase crop yields on the same number of acres we have in production today. In fact, it’s estimated that in the next five years, over 90 percent of additional corn production and 85 percent of additional soy production will come from increased yields alone on existing acres. There have been various inflection points in agriculture over time. The Green Revolution drove advancements in breeding that drove crop yield increases in the late 1960s and beyond. In the late 1990s, the introduction of new innovations in breeding and biotechnology further drove yield advancements. Today, I believe we’re at the beginning of another inflection point in agriculture that will drive significant increases in crop production – the Green Data Revolution. 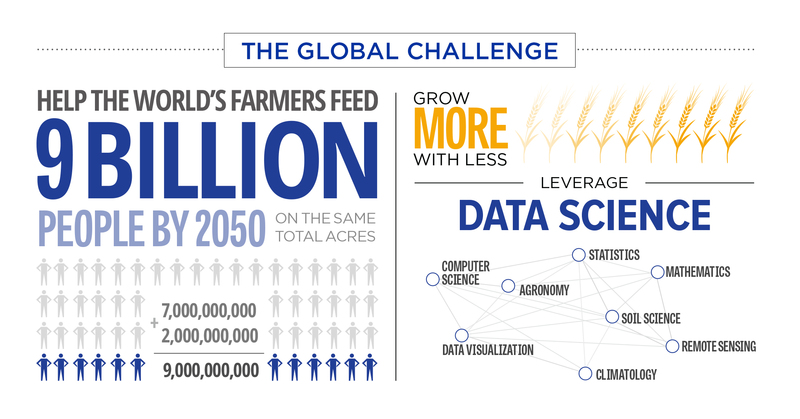 At The Climate Corporation, we believe that data and the application of data science can help farmers make more informed decisions about their operations that can increase crop yields and help them use resources more efficiently. Using data in this way is not a new concept. Other industries use data to drive decisions –Wall Street, health care, and even baseball. Data science starts with the collection of information from the environment. In the case of agriculture, we measure the soil, the field and the atmosphere. Understanding the composition of the soil is critical to developing insights and realizing better outcomes on the farm. During the growing season, remote sensing systems in equipment can enable real-time monitoring of actual field conditions. More accurate and precise weather observations, such as temperature, wind speed, and rainfall – gathered from radar, satellites, and local weather stations – allow us to build a deeper understanding of atmospheric conditions. At the Climate Corporation we use all these data sources to build models that predict potential outcomes for farmers and provide actionable insights they can use to make important crop management decisions throughout the season. Those insights range from the amount of nitrogen available in a field, to satellite imagery that helps farmers identify problems in the field before they impact yield. Providing more information for farmers as they make these management decisions will help to reduce the impact of field variability, improve yields and reduce risk. As with any new, emerging technology, there are some hurdles to overcome before farmers will feel comfortable using these tools on their farm. With data science technologies, we know that farmers are concerned about privacy and want to know how their agriculture technology provider will use their data. We directly addressed these concerns with our announcements last January about our approach to farmer data use and privacy at The Climate Corporation. We respect that farmers own their data. We are clear with farmers about what we will and won’t do with that data, and farmers can delete their data upon request. In addition to our own policy, we also have worked with the American Farm Bureau Federation, National Corn Growers Association and other companies in the industry to develop a set of principles for data use and privacy. And this is just the beginning. We believe these technologies will continue to evolve and provide even more value to farmers over time. Today, we’re on the cusp of the Green Data Revolution that will change agriculture as we know it today – a revolution that will help farmers grow more crops on the same acre of land with more efficient use of our natural resources. That’s what we believe is the definition of sustainable agriculture. At The Climate Corporation, we’re very excited to be a part of this agricultural innovation that can make such a difference for farmers around the world.